ABGL president Bharati Tamang began an indefinite hunger strike at Chowrasta here this evening to demand the arrest of Gorkha Janmukti Morcha leaders and activists charged with her husband’s murder. Half an hour into the fast, police asked the 69-year-old to lift the fast but she refused to do so. 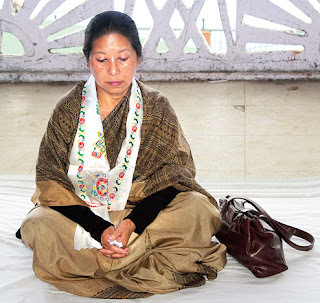 Bharati went to the spot of hunger strike, accompanied by about 200 supporters, from the Gorkha Dukha Niwarak Sammelan Hall, where the Democratic Front held an indoor meeting today. The Front, a conglomeration of ABGL, GNLF, CPRM and Sikkim-Darjeeling Ekikaran Manch, held the indoor programme after being denied permission by the district administration to hold a public meeting. Bharati started the fast at 4.24pm to seek the arrest of 23 Morcha leaders and activists, including GTA chief executive Bimal Gurung, who were charged with the murder of ABGL president Madan Tamang on May 21, 2010. A large posse of security personnel, including those from paramilitary forces, had already reached the hunger strike venue. The police also brought an empty bus near the stage where the fast was being held. Suraya Pratap Yadav, additional superintendent of police, Darjeeling, Purnima Sherpa, deputy superintendent of police (Darjeeling town), and Manoj Chakraborty, inspector-in-charge, Darjeeling Sadar, who were already at Chowrasta, approached Bharati and asked her to withdraw the hunger strike. “We would want you to lift the hunger strike as there are local people and tourists at this venue. This would cause a lot of inconvenience. A government function is also scheduled in the area,” said Yadav. The police also said a chargesheet had already been filed in the court and legal process had started. The supporters and leaders of the Democratic Front, however, started sloganeering for justice. As the sloganeering continued, the police officers decided to retreat and take stock of the situation from a distance. The ABGL had been denied permission by the Darjeeling municipality to use a stage, where cultural events are held, at Chowrasta for the hunger strike. So, she sat on the floor near the stage and began the fast. Earlier in the day, leaders of the Democratic Front lambasted the district administration for denying them permission to hold a public meeting. “They are now citing tourist season for denying us permission. However, when Madan Tamang was killed and the public meeting was about to take place, it was a peak tourism season even then,” said Govind Chhetri, the spokesman for the CPRM. Madan had been murdered on May 21, 2010, when he was overseeing the preparation for a public meeting at Upper Clubside in Darjeeling.